The website referred to in the blog post is now closed. Links will lead to the sandbox development site as a living archive and extended demonstration. Drupal 7 with custom module selection for unique combination of requested features. Third party database integration into content and theme (ChamberMaster). Method for complete and seamless integration was invented by SDOC Publishing. Response theme for complete mobile use, including “web app” prompt to save an icon and splash screen from the website. Innovation cut several thousand dollars in development cost. Multiple custom blogs for fast information update by office staff and other employees. Custom-built icon bar with mega menu for additional content on the front page while maintaining a simple, streamlined presentation. Additional capabilities include document management, multiple translations selectable by the viewer, multiple calendars, and workflow management. WEBMASTER SERVICES: SDOC assisted with instructing and advising office staff on how to add and edit different types of content, arrange content, especially involving third-party integrations, problem-solving, and adding new capabilities when needed. SDOC assists with domain name management as well. SDOC has arranged all hosting, security, software upgrades, and system backups from 2011 til 2015. Read the blog post at Dunwoody Working Girl for complete specs. Version 4, commissioned by Don Boyken. Website design emphasis on simplicity and elegance with only a few pieces of content on the front. First introduction of infographic slideshow. Version 3, 2011 commissioned by Debbie Fuse/Bill Grant as first design incorporating the “unified branding” standards. Website was still in Drupal 6 and mobile/smartphone usability was not yet a major issue. Version 2, August 2009. First Drupal version of the website, using modified stock Acquia Marina theme. SDOC only arranged and maintained content. It wasn’t until Version 3 that SDOC took over design direction and hosting. Version 1 (not shown) was a Joomla-based website, using the stock JSN Epic theme for business. 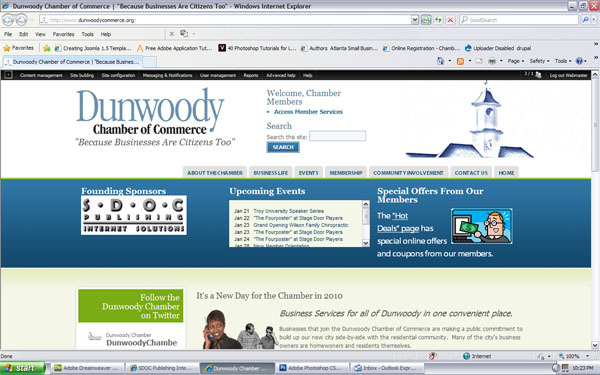 The Sandy Springs chamber adopted exactly the same CMS and theme (still in use today) before Dunwoody switched to site above. 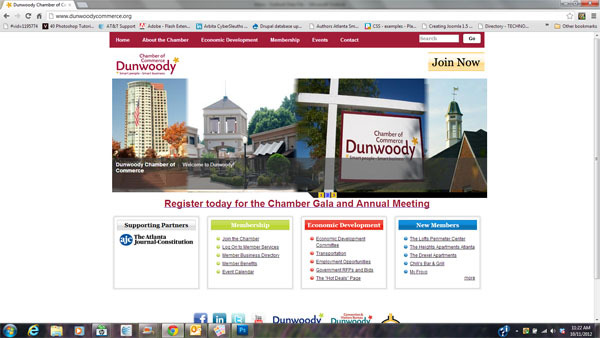 The Dunwoody Chamber also hosted several additional websites in an array dedicated to individual committees or events. The one website admin dashboard managed all of the sites simultaneously even with their different appearances, menus, etc and could even deploy banners and other special content across all of them at once. 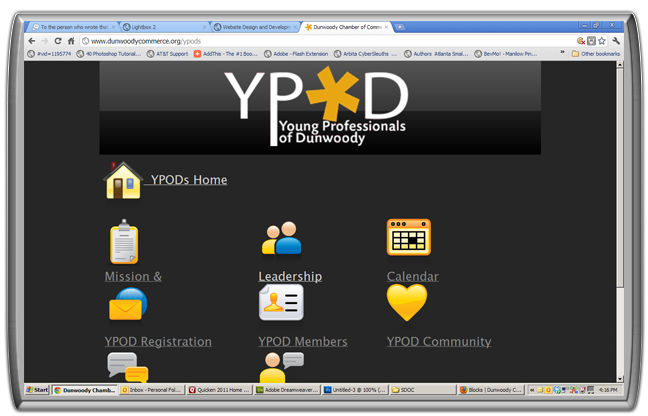 YPODs – Young Professionals of Dunwoody. 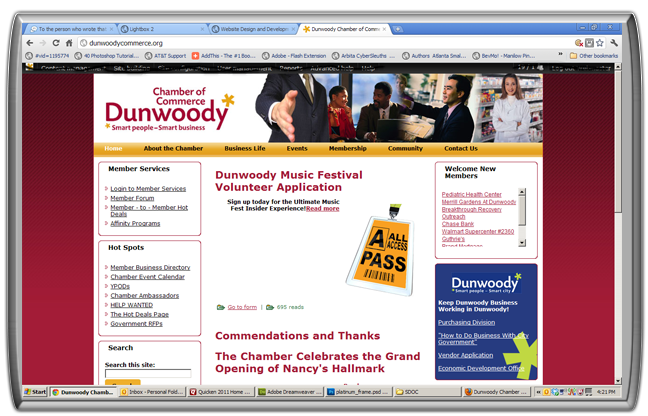 First “subsite” created for the Chamber and first to accomodate mobile devices, even though it was not responsive. 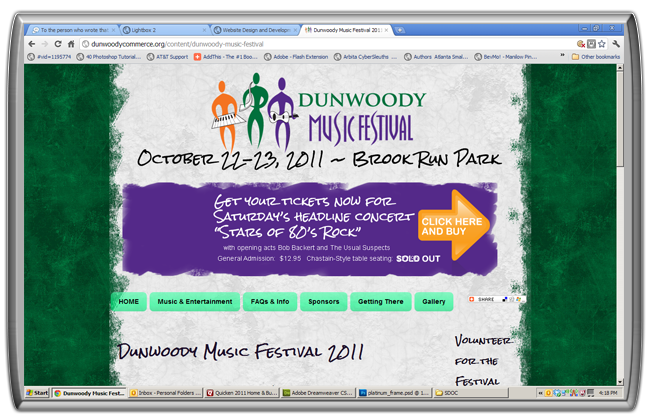 Dunwoody Music Festival 2011. Another subsite with its own theme and menu with online submission forms for contestants, sponsors, and photo gallery contributions. 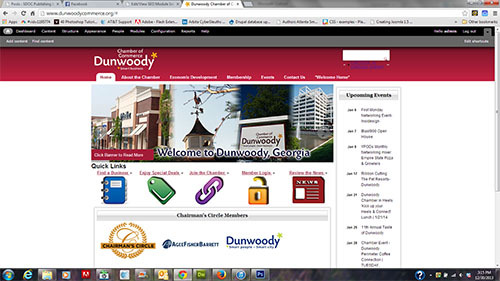 Greater Perimeter Business Expo was a joint event between Dunwoody and Sandy Springs. A “clean” install served two purposes: it was the first test of the Drupal 7 upgrade with 3rd party data integration and served as “neutral ground” for the two chambers to collaborate without accidentally editing one or another’s main website information.